The 28th of October, a far-right politician, Jair Bolsonaro, has been elected as Brazil’s new president. He is also known as the Brazilian Donald Trump. But who is he ? He was an army captain and then a congressman for more than 20 years. He has been criticized for misogynistic, homophobic, and militaristic views. For instance, he told a left wing congresswoman, Maria do Rosario, in 2014 that she didn’t deserved to be raped by him because she was ugly. Regarding his election, he received 46% of the votes during the first round and received 55,13% of the votes for the second one. The voters were workers that are sick of the unemployement and the corruption but also people from the upper class. Bolsonaro was able to gather votes from all the social classes. His key-measures are the fight against corruption, a retirement reform and eventually a gun law. For the former, the judge Sergio Moro will be the Minister of Justice. He sentenced Lula, former president of Brazil, to 12 years of prison for corruption. Jair Bolsonaro will take office on the 1st of January 2019 and only the time will tell us if he can keep his promises. Angela Merkel has been the leader of the Christian Democratic Union of Germany for over two decades. She has confirmed she will not run for re-election as its chairwoman in December. During the regional elections, the party suffered heavy losses that threatened the stability of the governing coalition. Who will be her successor ? There are 3 candidates : Annegret Kramp-Karrenbauer, Jens Spahn and Friedrich Merz. The first one, AKK, combines social conservatism with liberal immigration policies. The second one is a fiscal conservative and a law-and-order figure. The last one is the oldest competitor of Merkel and has far more conservative views on the immigration. However, Angela Merkel will stay Chancelor until 2021. Donald Trump, end of the birthright citizenship ? On Tuesday, during an interview with Axios, Donald Trump claimed that he could end the right to citizenship for the children of non-citizens and unauthorized immigrants born in the US. However, in the Consitution that was amended 150 years ago, it is written in the 14th Amendment: “All persons born or naturalized in the United States and subject to the jurisdiction thereof, are citizens of the United States.” It was adopted after the Civil War. The 14th was created to protect the citizenship of the freed, American-born former slaves. For the US President, it is a ridiculous policy that he can end with an executive order. However, is it possible to do that ? For many legal experts, President Trump can not end this right. To do so, he needs a constitutional amendment, but that would require a two-thirds vote in both the House of Representatives and the Senate and approval by three quarters of US states. For now, we can say that it is unlikely to happen anytime soon. More than 7.000 hondurians people are going to the US. Why are they leaving ? FIrst of all, the Honduras is the most dangerous country on earth. The annual rate of homocide is 56 for 100.000 inhabitants. There are many gangs in California and the US decided to deport them in their native country. However, it brought an amount of violence Honduras was not ready to fight. Also, the corruption, the poverty and the lack of respect of the right of the indigenous community are also reasons to immigrate. The NGO, Pueblo Sin Fronteras, created in the US is organizing the caravan. The director of PSF Central America, Ireneo Mujica, will be in the caravan. 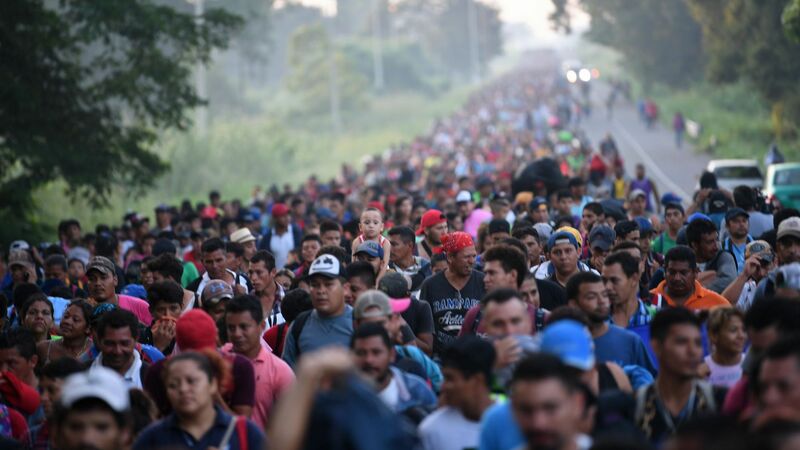 President Trump tweeted : “Many Gang Members and some very bad people are mixed into the Caravan heading to our Southern Border. Please go back, you will not be admitted into the United States unless you go through the legal process. This is an invasion of our Country and our Military is waiting for you!”. He announced the deployment of 800 military people on the Mexican border. China has had people talking about them in the past few weeks. They are fighting a “large-scale” war against some of its people. Indeed, Xinjiang (an autonomous territory in North-West China), is indicted to hold some minority groups in “re-education” camps. These minorities are mostly Uyghurs Muslims (and other Muslim groups). Who are the Uyghurs? Well, they are predominantly Muslims and are about 11 million in Xinjiang region. They are ethnically close to Central Asian countries. In October 2018, the Chinese North-Western region has promoted a law to legally deport Uyghurs in “vocational training centers”. Theoretically these centers are made to correct bad behavior, provide counselling, stop the terrorist expansion in China. However, it is seen as a cultural genocide around the world. According to Amnesty International, “The mass internment camps are primarily places of punishment and torture, not learning. There are consistent reports of beatings, food deprivation and solitary confinement.” Once again, a world-class crisis is letting us open-mouthed as International Institutions are kind of turning a blind eye to a matter that has been lasting for years now. One of the most disruptive news this month focuses on the murder of a Saudi journalist, Jamal Khashoggi. In the early days of October, Jamal Khashoggi suddenly disappeared from Saudi Arabia’s consulate in Turkey. Investigations have first reported an abduction. However, the Turkish government condemned Saudi’s government of having commanded the abduction and the murder of Jamal Khashoggi because of compromising tribunes targeting the Saudi crown-prince, Mohammad Bin Salman Al Saud. The Turkish president said, “We are determined not to allow those responsible — those who ordered the crime and those who committed it — to escape justice.” On the other hand, the Kingdom of Saudi Arabia admitted the murder. Khashoggi died strangled after a fistfight in the consulate. Plus, they later said that the initial plan was to return Khashoggi to Saudi Arabia and to release him later on. However, Western countries discredited this version and blamed KSA of lying. Also, they are currently pressuring KSA to provide clear proofs and explanations: Donald Trump accused Riyadh of lying on the situation, Germany is ready to stop selling weapons to Saudi Arabia, … Riyadh has shown its will to be “transparent” and share information with its allies. Investigations are still ongoing. The freshly elected Brazilian President, Jair Bolsonaro, has given a glimpse of Brazil’s future International policies. In fact, one of his top priority on the international stage is to improve the country’s relation with Israel. Something most likely to happen successfully, since Benjamin Netanyahu was one of the first to congratulate Jair Bolsonaro for his recent access to power. Also, Bolsonaro shown himself as an ardent supporter of Israel during his campaign. In fact, he intends to visit Jerusalem as soon as possible. And, vice-versa, Netanyahu is likely to visit Brazil in the days to come. Beyond any friendly visits, Bolsonaro has proclaimed his will to transfer the Brazilian embassy from Tel-Aviv to Jerusalem. Moreover, he has decided to close down the Palestinian embassy in Brasilia. Few are the countries that recognize Palestine as a State, and Brazil is no longer one of them, “Is Palestine a country? Palestine is not a country, so there should be no embassy here,” said Bolsonaro. It looks like the State of Palestine is losing a powerful supporter in a time where Palestinians are suffocating at Gaza border. As we know, the result of the 2016 referendum for the Brexit is still being questioned. Two years later, people from all over Europe are still protesting against the leaving of the UK from the EU. Besides the populist rises that the Brexit has triggered, Brexit could harm people more than helping them. People may lose their job, comprise their children’s future… Citizens are now realizing and asking for a second referendum to get “people’s vote.” According to the Guardian, 700,000 people from all over the UK marched in London, on the 20th of October, to demand the said referendum. “People have woken up to the potential disaster,” said Vince Cable, the Liberal Democrat leader. “We’ve realised there isn’t a good deal coming out of this and a lot of people are frightened, people are worried.” This is the largest demonstration since the 2003 protests against the war in Iraq. However, things cannot be that simple. Indeed, allowing a second referendum could damage the democratic ideal in a sense that people clearly voted to get out of the EU. It is not likely to find a solution that will suit everyone. “People have to step back from their ideological obsessions and accept a pragmatic compromise. Otherwise we risk inflicting on ourselves massive economic damage, as well as political damage, domestically and internationally, for years to come,” said the Foreign Office minister, Sir Alan Duncan. The current situation is accentuating the schism of the British population. BBC News. 2018. Angela Merkel to quit as CDU party leader – BBC News. [ONLINE] Available at: https://www.bbc.com/news/world-europe-46016377. BBC News. 2018. China Uighurs: Xinjiang legalises ‘re-education’ camps – BBC News. [ONLINE] Available at: https://www.bbc.com/news/world-asia-45812419. Kevin Liptak and Devan Cole, CNN. 2018. Trump claims he can defy Constitution and end birthright citizenship – CNNPolitics. [ONLINE] Available at: https://edition.cnn.com/2018/10/30/politics/donald-trump-ending-birthright-citizenship/index.html. Laura Smith-Spark and Hamdi Alkhshali, CNN. 2018. Jamal Khashoggi killing was premeditated, Saudi attorney general says – CNN. [ONLINE] Available at: https://edition.cnn.com/2018/10/25/middleeast/saudi-turkey-khashoggi-investigation-intl/index.html. Libération.fr. 2018. Du Honduras aux Etats-Unis, à qui profite la caravane des migrants ? – Libération. [ONLINE] Available at: https://www.liberation.fr/planete/2018/10/24/du-honduras-aux-etats-unis-a-qui-profite-la-caravane-des-migrants_1687286. The Guardian. 2018. Jair Bolsonaro’s provocative views in six clips – video | World news | The Guardian. [ONLINE] Available at: https://www.theguardian.com/world/video/2018/oct/29/jair-bolsonaros-views-on-homosexuality-torture-and-more-video. The Guardian. 2018. Jamal Khashoggi death: give us the facts, western countries tell Saudis | World news | The Guardian. [ONLINE] Available at: https://www.theguardian.com/world/2018/oct/21/jamal-khashoggi-germany-and-eu-condemn-saudi-explanation-of-death. Next What would be the impact of an United States withdrawal from the INF treaty ?